Deep fried rolled corn tortillas, stuffed with chicken. Served with home made salsa, sour cream, lettuce and queso fresco. Sauteed chicken breast with capers, fresh tomato in a reduction of fresh garlic, white wine and lemon juice. 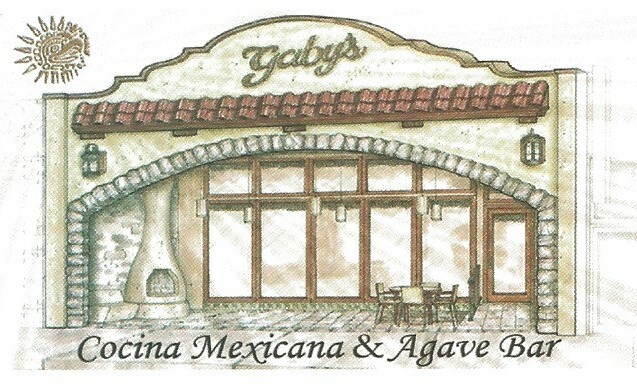 Gaby's Cafe would like to welcome you with our very own creation of freshly made Guacamole at your table side. Stuffed mushrooms with our very own recipe of seafood stuffing's. Baked to perfection. Sauteed with garlic, white wine, fresh herbs and lemon juice reductions. Tortilla chips with refried beans, chorizo, melted cheese, jalapeno pickles, sour cream & guacamole. Tortilla chips with refried beans, grilled zucchini, carrots and eggplant, melted cheese, pickled jalapeno, sour cream and guacamole. House Salad with your choice of ground beef or grilled chicken over a fried tortilla bowl. Fresh spinach, hard boiled egg, red onion, sliced tomatoes, mushroom and bacon. Grilled marinated chicken with onions, zucchini, and peppers. Marinated grill chicken, skirt steak, shrimp, onions, zucchini, and peppers. Marinated grilled salmon, shrimp & scallops, onions, peppers, and zucchini. Marinated fillet mignon with onions, peppers, and zucchini. Marinated chicken, calamari & chorizo with onions, peppers, and zucchini . Lobster tails and filet mignon with onions, peppers, and zucchini. Grilled marinated skirt steak with onions, zucchini, and peppers. Tacos (3) Rolled on soft corn tortilla with fresh guacamole and homemade salsa. Deep fried rolled corn tortillas. stuffed with chicken. Served with homemade salsa, sour cream, lettuce and queso fresco. Deep fried flat corn tortilla with black beans, homemade salsa, sour cream, lettuce and queso fresco. Sea food combination of clams, shrimp, mussels & scallops with chicken & sausages cooked together with saffron rice.